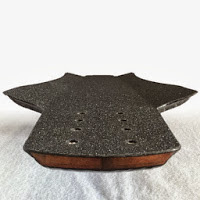 Littleton, NH: Sandwich Tech recently released an updated version of their Sparticle downhill longboard, featuring new ironwood sidewalls. This is ideal for skilled riders looking for top-notch performance from an exceptionally strong and light downhill racing and high speed carving deck. The board continues in Sandwich Tech's tradition of well built sandwich construction. The Sparticle is extremely light, at just 2.4 lbs. The deep tri-plane concave, topmount design, and triaxial carbon facings provide superior leverage for initiating drifts and hard carves. The updated version of the 40 inch Sparticle board features a new thin and stiff SparCore design. The SparCore design is aerospace inspired and ideal for riders looking for a quality product. 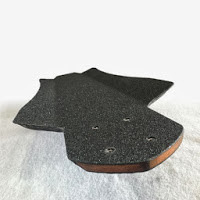 Look for Carbon Fiber Longboards on Sandwich Tech's website. We do not have an Instructable. If you are interested in our boards, please email any technical questions to matt@sandwichtechboards.com. Longboard with ironwood sidewalls? It's interesting! And how it to ride on it? Share with your experience please guys! One my friend advised me one shop because I wanted to buy longboard decks https://x3mboardshop.com/longboards/decks/ for different kinds of weather. I am a professional and also take part in different competitions in the world. It is really exciting that sandwich tech's new sparticle wit IRONWOOD sidewalls. As a tech lover, I appreciate this type of post as mentioned above in detail. I just love it and I will share this post on my social media page to see my friends. Thank you so much and keep posting things like this. Nerds support provides high quality IT services Miami and cloud computing services in Miami and South Florida. Find award winning voip service and its experts in Miami today! Moreover, the rates for the utilization of this technology are more affordable than what phone organizations charge for long separation calls.
. Located in the Keweenaw Peninsula, which was known as "copper country" due to the extensive copper mines that littered the area,ENGINEERING MUT The Michigan Mining School attracted a strong group of engineering students eager to make a living in the copper mining business. I feel really happy to have seen your webpage and look forward to so many more entertaining times reading here. suraj bhan dav public school vasant vihar Thanks once more for all the details.